Fresh from the garden. Photo courtesy of my sister L.K. After all grilled food I shared yesterday it was only natural to post some dessert. Although my plan was to share with you my biscotti recipe, my morning conversation with my parents and my sister made some changes to my posting schedule. They were having an unexpected family reunion at my parent's house (unexpected meaning it wasn't planned, but many relatives showed up: often happens in our house! ), and she sent me a picture of the table, nothing fancy, just an usual late summer meal: stuffed peppers, some meat, garden vegetables, feta cheese, mushrooms (oh, my mother's mushrooms: she makes it amazingly delicious, and she picks them too), some antipasti in the very low right corner, and roasted plums in the middle. Nothing fancy... Photo courtesy of my sister L.K. Roasted plums? That sounds interesting, and what about grilled plums? Yes, I can do that now! As soon as my Skype conversation was over, I went back to the kitchen to create. I didn't have all the ingredients for those beautiful roasted plums my sister made, so I made my own. In a bowl combine all ingredients and place on a grill for 4-7 minutes. Here is another advantage of panini grill with adjustable plates: I was able to place plums cut side up to prevent juices from leaking, and I also set the top plate just to touch the plums, without squishing it. 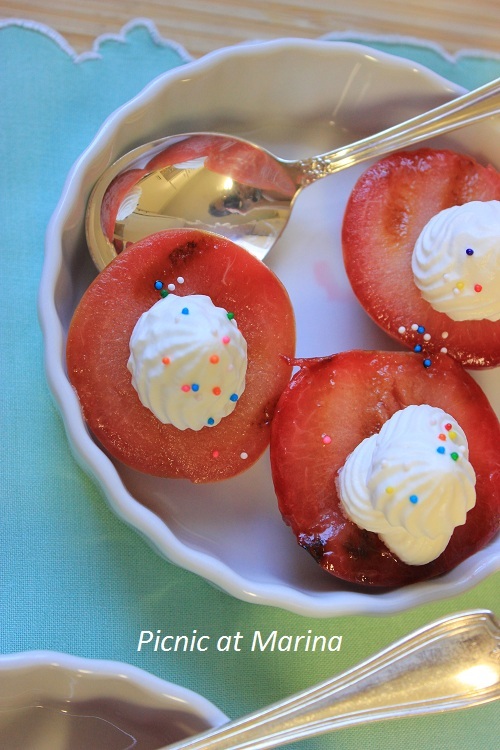 I decorated grilled plums with whipped cream and some sprinkles. To some degree I felt as I participated in the family reunion, thanks to Skype. Does your family has spontaneous evens, or it is always planned? This same thing happened to our house many times in the past and my mom always had a few recipes for such occasions. These plums look very appetizing and elegant Marina and I am sure everyone missed you in this family reunion! Skype is a wonderful thing! What BEAUTIFUL plums... love the addition of sprinkles! My teenager loved it, I guess it passed a teenager test! :) Thanks for your comment! I love Gran Marnier - such good stuff to bake with or make sauces with. Bet the plums were great! I love Grand Marnier too, and not only in food sometimes. Shell we get a drink, Averie?! :) I am sure we would have tons of fun and many topics to talk and laugh about: kids, family, cooking, Anthropology, cameras, etc... And guess what? Because I don't eat sweets, all deserts are yours! :) Thanks for stopping by! What a lovely table of food! I love it that we can be a part of things virtually when we can't be there in person! Although there are many negative things about the web, there are also so many wonderful things that keep us all better connected! Love your plums, so pretty and tasty sounding! Thanks for sharing the lovely table of food via your sister, Marina. Everything looks so good, especially love the stuffed peppers. Wonder if you can get the recipe for them! 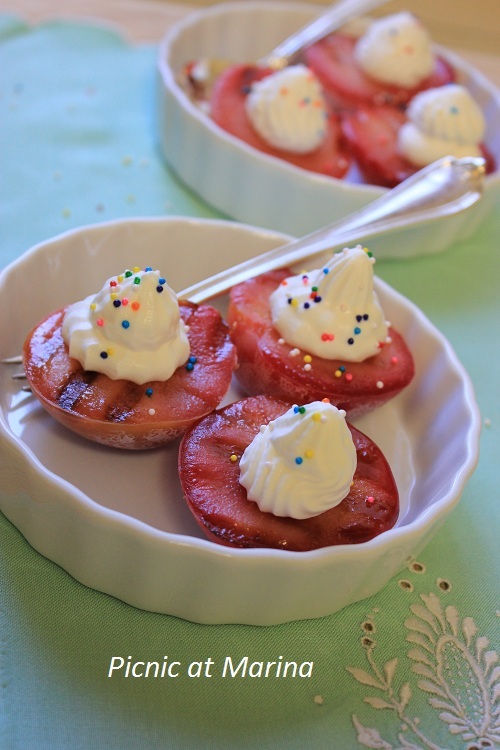 Your grilled plums are so perfect sweet, and over the top yummy with the Grand Marnier, and the fun topped whipped cream:) Yumm! Hi Elisabeth, Oh yes, the recipe for those stuffed peppers has been in our family for generations, I've learned it from my grandmother and mother, and it is very easy. The thing is that those European peppers, they call it Bulgarian for some reason, have so much flavor itself. I make it often here, and my mother made it when she was here last January, but without that pepper it tastes different. You know, to have those peppers in the winter months, my mother preserves dozens of 3 liter jars of this peppers, that's how unique they are. I know, fresh fruits from the garden are amazing, and I don't even wash it, just wipe it out and enjoy. Ouch, 10 years is a long time. I hope you join your family reunion soon. My family is big, and loud, but fun and I love them so much! I've never roasted - or grilled - plums. Love the idea! These must have tasted wonderful. Love the sprinkles - fun touch! Hi John, now with my new toy in the kitchen I grill everything! :) Teenager has fun trying to grill some things. Last night he offered to grill pasta... :) Thanks for the compliment on the plums! I love when you make dessert :) Your grilled plums sound fantastic with a bit of Grand Marnier and topped with whipped cream! I'm glad you got to Skype with the family and bring some of the reunion back to your house through this recipe. Your mom knows how to put out a magnificent spread...no wonder all the relatives like to show up!! The opening photo of the freshly-picked fruit was quite beautiful, Marina. A nice still-life of the season's harvest. Isn't it incredible how much flavor grilling adds to fruit? Your plums, sprinkles and all, look so tasty! My family is now rather spread out now. It's hard for people to just drop in unexpectedly. We do manage to get together, though, and it's always a good time. my extended family doesn't have too much spontaneity but my immediate one does---love all that beautiful food!! You know you are so welcome in my house! What a feast, love spontaneous reunions, and your mom's mushroom dish looks delicious! 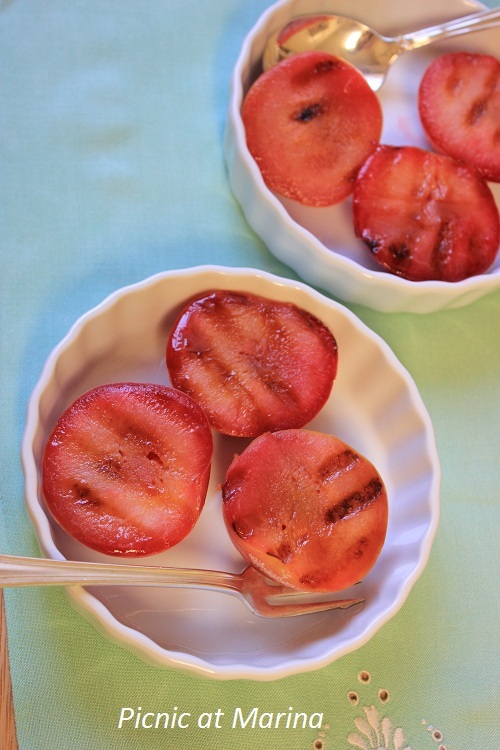 And those fresh grilled plums with Grand Marnier, just perfect! Your plums are very pretty! I love plums! I bet they were great grilled! Thank you Charles! Sometimes I go fearless in the kitchen and try all kind of things... :) Sometimes doing less is all what's needed to enhance the taste or bring up a flavor.